King John died in one of the rooms in Newark Castle. It is also said that this room was also the setting for a suicide: in the early 1900’s a castle range was found swinging by the neck in the Kings bedroom. It is said that tour guides have walked into what remains of the room to see the body, hanging from the ceiling, moving and jolting, asif it were struggling for breath. In the dungeon, hushed voices can be heard at night, and occasionally loud chanting has been heard echoing from the empty chambers. When inside the dungeons themselves, visitors have experienced stones and coins been thrown from the shadows, as well as loud bangs coming from the now completely empty rooms. Flashes of light have been spotted in the castle grounds, as well as screaming and shouting being heard from the curtain wall which borders the river. Visitors in the castle grounds after the sun has gone down have experienced cold spots, and those brave enough to hold a vigil in the undercroft have felt a presence in the room with them, and had cold shivers down their spine. As with most of the haunted sites, I visited Newark Castle both in the day and at night. During the day, there was no evidence of any paranormal activity. The area around the castle has been turned into a park, and it was busy with people. It is hard to imagine in a situation like this that any haunting could be possible. At night, the castle is very imposing. Walking along the river bank underneath the curtain wall and looking up at the Kings Bedroom, I did think that I saw a figure stood at the window. Of course, this could have been a trick of the light, with the moon being very bright on the night. I spoke to Mr Peter Cox of Newark, who visited Newark Castle as a boy on a school trip, and felt sure that he had a paranormal encounter. “I would have only been 12, it was the first trip I went on at secondary school.” Said Mr Cox. Standing on an intersection between the Fosse Way, the Great North Road and the River Trent, Newark Castle has always been a strategic stronghold, and began life as a fortified Saxon manor. In 1073, the manor was turned into a castle, as the Bishop of Lincoln, Robert Bloet added a motte and bailey. Around fifty years later, Bishop Alexander the magnificent turned to fortress into a full stone castle, before further construction which included the curtain river wall which still stands today was added in the late 1200’s. The castle has played a key part in many battles in Britain. It has withstood five sieges during both the civil and baronial wars, when it remained a key royalist stronghold, until its surrender in 1646 under the command of King Charles the first. Following the surrender, the castle was open to royal guests to use. One of the most famous royals to use the services of the castle was King John. He died at the castle on the 19th of October 1216. He was rumoured to have been poisoned, by order of the Pope. Following the kings death, the castle fell into the hands of his captain, Robert de Gaughy. This didn’t sit well with the new king, Henry the third, who laid siege to the castle for a week before de Gaughy surrendered. 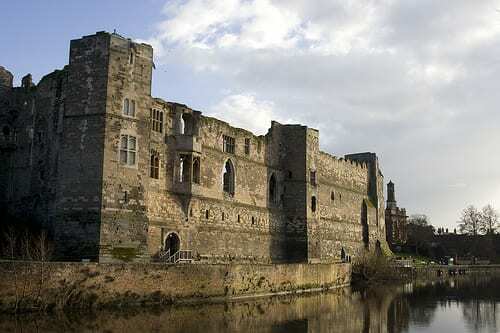 After surviving sieges throughout the civil war, Newark Castle was ordered to be destroyed by the parliamentarians. However, following an outbreak of the plague in the town, orders weren’t carried out fully, and some of the castle remained standing. Four of the rooms in the castle still remain intact today, including the Kings bedroom where King John died. The undercroft, which was believed to be used to practice black magic from the 1750’s to the 1900’s is still accessible, as well as the dungeons, which were rumoured to be a meeting place of the famous Knights Templar.